Finkelstein, Maxwell W.. "Mount Revelstoke National Park". The Canadian Encyclopedia, 25 January 2018, Historica Canada. 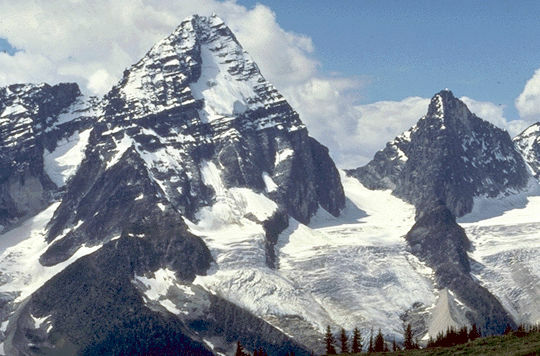 https://www.thecanadianencyclopedia.ca/en/article/mount-revelstoke-national-park. Accessed 25 April 2019. Mount Revelstoke is generally acknowledged as the birthplace of alpine skiing in Canada, and it was established, in part, because of its recreational potential. Today cross-country skiing and snowshoeing are popular winter activities. The park offers primitive backcountry campsites. 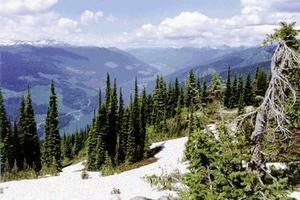 Mount Revelstoke Park, BC, above the Columbia River (photo by James Marsh). Mount Revelstoke National Park (est 1914, 259.7 km2) is a place of contrasting landscape, varying from rain forests and lush alpine meadows to barren, rocky ridges and glaciers. The jagged spires of the Selkirk Mountains are the backdrop for this park. Grizzly bear and caribou range throughout, while mountain goats frequent the rocky bluffs. Due to the small size of the park, and extensive clear-cut logging in adjacent lands, the park lacks ecological integrity, and its populations of large mammals, particularly caribou, are threatened. Alpine meadows feature pika, hoary marmot and golden-mantled ground squirrel, often under the gaze of the golden eagle. Between October and June the park is covered in a thick blanket of snow, but in the brief summer, meadows glow with the blossoms of lupine, aster and Indian paintbrush. 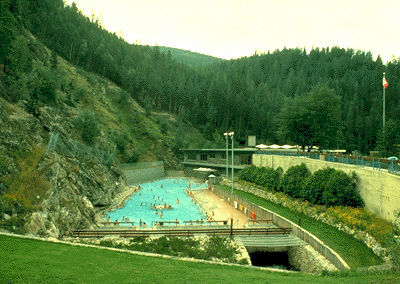 The Meadows in the Sky Parkway provides road access to lush alpine meadows. Mount Revelstoke is generally acknowledged as the birthplace of alpine skiing in Canada, and it was established, in part, because of its recreational potential. Today cross-country skiing and snowshoeing are popular winter activities. The park offers primitive backcountry campsites. 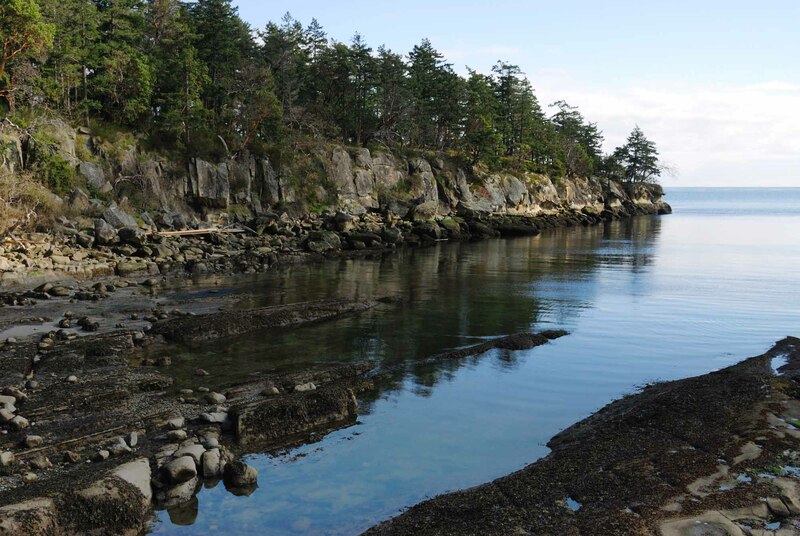 Private campgrounds are located nearby on the Trans-Canada Highway. See also National Parks of Canada. Mount Revelstoke National Park of CanadaThis illustrated Parks Canada website describes the ecology, geography, and history of Mount Revelstoke National Park of Canada.